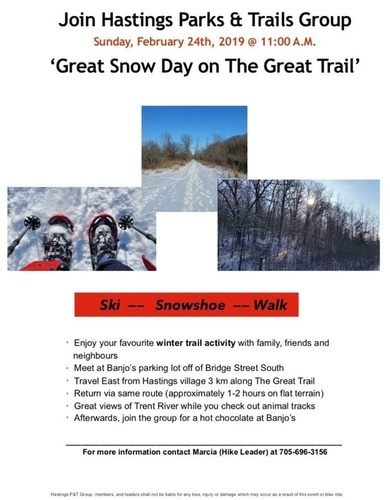 Join the Hastings Parks & Trails Group on Sunday, February 24th for a Great Snow Day on the Trail. Ski - Snowshoe - Walk. Enjoy your favourite winter trail activity with family, friend, and neighbours. Meet at Banjo's parking lot and travel East from Hastings along the Great Trail and return. Afterwards, join for a group hot chocolate at Banjo's.